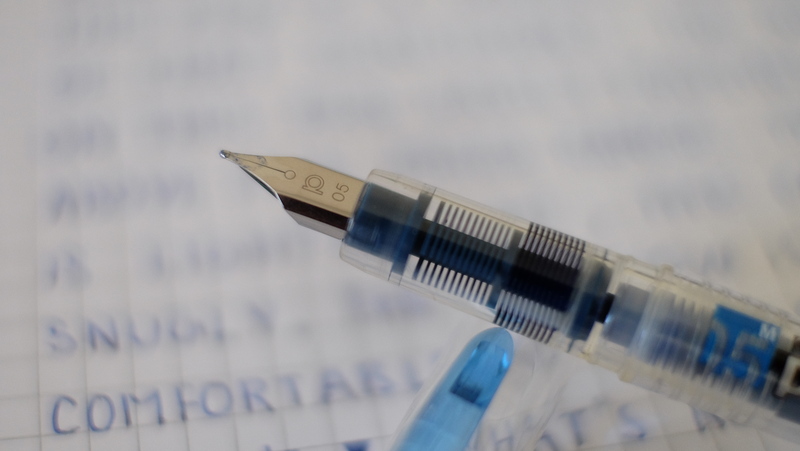 When it comes to fountain pens, higher price doesn’t always mean higher quality. This pen is an embodiment of that principle. The nib on this pen easily matches those above its price range. The body is lightweight, the cap posts snugly, the ink flow is smooth, its comfortable to hold, and its only $5! For a disposable pen, it has got to be one of the smoothest out of box nibs I’ve ever had the pleasure of testing. The color of the ink is vibrant, and there are a lot of choices when it comes to colors. 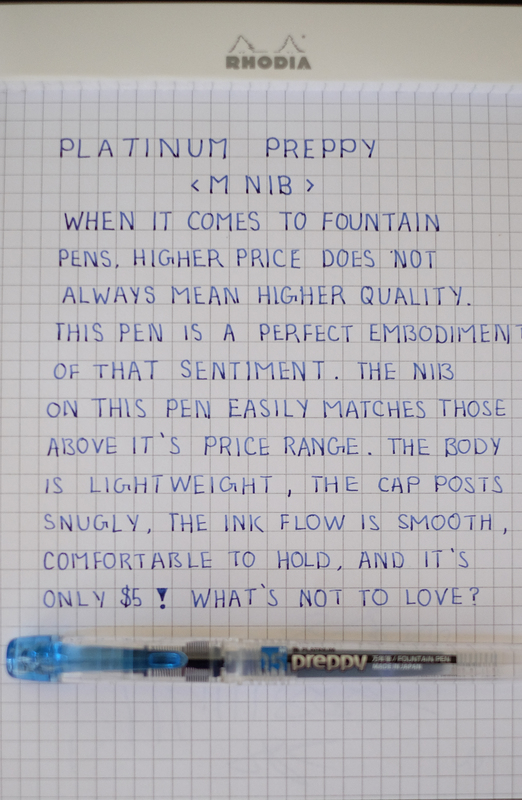 I personally went with the medium nib, as Platinum’s fine is too fine for my taste. It turned out choice was correct. For my writing style and preferences, the medium (0.5) was the fit. Currently, Platinum offers this pen in EF, F, and M. It’s a good fountain pen for those who have never used one before. 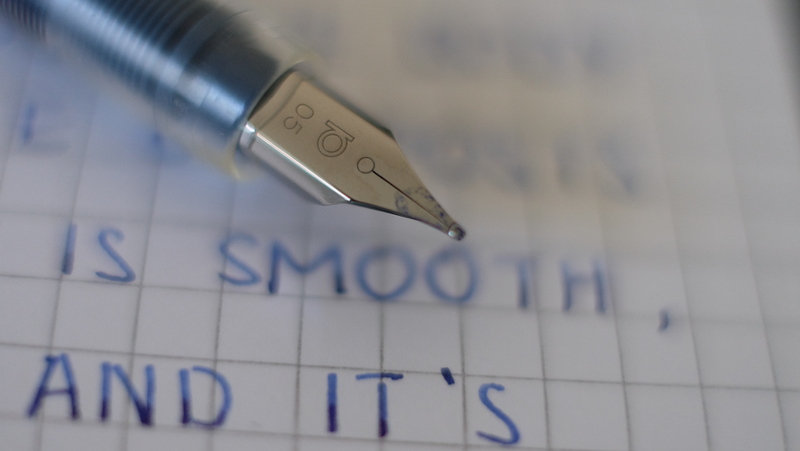 At only $5, it’s simplicity itself to find the nib size that is right for you. The see through grip provides a nice view of the feed, improving the aesthetics overall. The pen only the 3 sections: nib and feed, body, and the cap. It’s simple to disassemble, should you have to, and you’ll be able to do it while not being afraid of losing anything. This pen is disposable, so after the cartridge is finished, you can just throw it out. 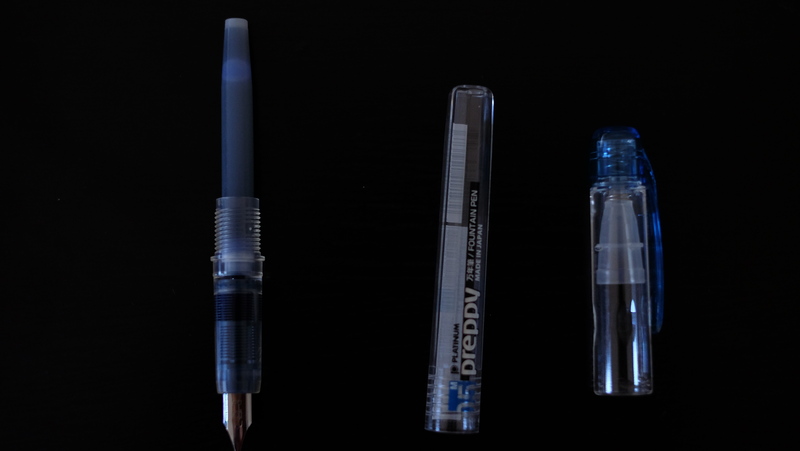 However, after taking to the interwebs, I have found out that pen enthusiasts who saw a lot of potential in the Preppy, somehow converted it into an eyedropper pen. If you’re interested, Brian Goulet of the Goulet Pen Co. put out a great video tutorial on converting the Preppy to an eyedropper. So check it out! DISCLAIMER: I have no affiliation with Brian Goulet, or the Goulet Pen Co. I am just one of their happy customers. There appears to be a classic typo in the second sentence of your review: “The pen is” has become anatomical on the screen of my iPhone 6. Oh dear, thanks for pointing that out. My keyboards been giving me a lot of trouble lately. I’ll be sure to proofread all my posts when I’m fully awake going forward.